There are several ways to introduce data into our Tables. The simplest one is to do it directly into the Table. From here, we can introduce, modify and see all the existing data in a Table. 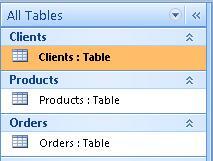 To access the Table, simply double click on it. We will start with the Clients Table. This will open up our Table. Do not worry if you can't see the entire table or the name of each field completely. This happens because the length of the field is shorter than the text written in it. To see the rest of the fields, we can use the scroll bars. At the bottom (red box), you also have some buttons that can help you navigate around the Table. The First one, for example , will take us to the first record in the Table. Check out the others as well. The last one is used to place a new record. As soon as we start typing a new record, a new record will appear automatically on the row below. Access will create one new record for every one we type in. Client's Code: This is an Autonumber field, which means Access will assign an automatic sequence for every record we introduce. Obviously, these Records are fake. In case somebody actually has these telephone numbers, I'm sorry for any confusion.